Sultry, somber or sassy. Women love drama! Unleash your drama quotient with Lakme's Drama Stylist Crayon. Step 1: Choose your eye shadow crayon shade from the 8 super long wearing shades. Step 2: Apply the shadow directly with the pencil tip onto the eye lid. Step 3: Smudge the color quickly on the eye lids as It is a quick dry formula. 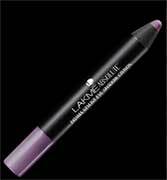 Step 4: Accentuate the look with applying Lakme Absolute dramatic eyes mascara.